With a simple premise and a focus on its concept, does Drunkn Bar Fight represent the best way to take out your drunken anger? Read on to find out. Drunkn Bar Fight is one of those games that makes you smile from the title alone. I immediately had delusions of grandeur when I thought about playing this with a group of people. From the main hub area, you can waltz into one of three different bar settings and start wreaking havoc. Things start simple, but you’ll soon find yourself facing off against numerous enemies. You play standing with two Move controllers representing your hands. Movement is a little clunky, but the ability to move forward, backward, and rotate using the face buttons kept tracking issues to a minimum when it came to a room scale experience. Simple punching moves will work for a while, but you’ll need to get creative with using the environment. I’ll admit I probably laughed a little too hard when I was throwing darts into a guy’s face as he lumbered toward me. Similarly, I never got tired of pouring a bottle of beer over a guy’s head before smashing it on his noggin. Drunkn Bar Fight is simple, hilarious fun. While there are specific moves you can pull off and score tracking for each of the stages, this isn’t a game you’re going to spend countless hours with. It has moments where it can feel janky in terms of the tracking and animations, but these moments are peppered with situations where you are throwing chairs, smashing bottles, and wildly punching your way to victory. Is it a perfect or in-depth experience? No, but it’s not trying to be. The game bills itself as a simple concept for people to play while they’re hanging out. If this were a non-VR title, it would lose interest pretty quickly, but that extra level of motion and immersion elevates it to a fun little experience. Drunkn Bar Fight is isn’t an incredibly sharp or detailed game in PlayStation VR, but it gets the job done pretty well. The environments have a respectable amount of detail, and object behave with realistic physics for the most part. The animation on your arms as you punch and throw can often look like they’re made of gelatin, but part of this comes down to the wild nature of the gameplay, which allows you to swing your arms around like a maniac as much as you want. The stoic and stern faces of the patrons as they march toward you convey a small amount of emotion, but they are extremely punchable faces nonetheless. The ability to change the music in the bar before you get started is also a nice touch. 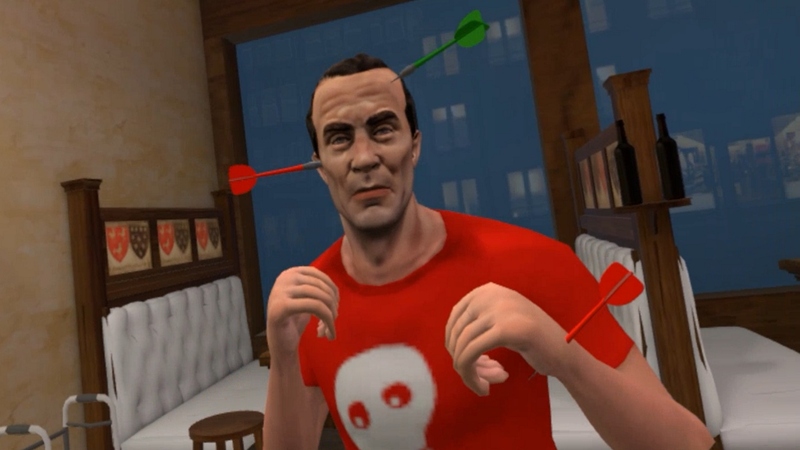 Drunkn Bar Fight doesn’t revolutionize VR, but it does make good use of the technology and provides a fun experience surrounding its whacky concept. If you are looking for a good party game to pass around amongst friends, you could do a lot worse than Drunkn Bar Fight. Just, try to drink and VR responsibly, we don’t need any headsets or televisions getting broken because someone got a little too into it.